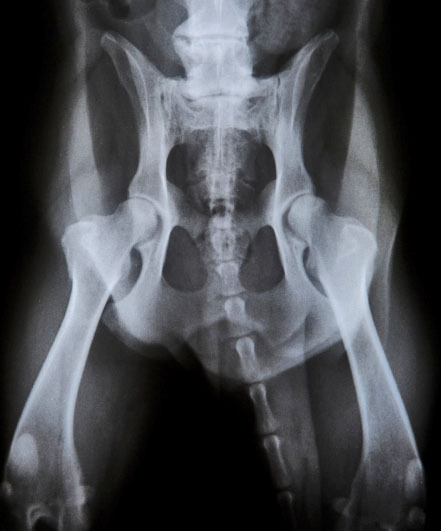 PennHIP screening allows a breeder or owner to screen their animal for future osteoarthritis in the hip joint at as young as 16 weeks of age. Many breeds of dogs are predisposed to osteoarthritis (OA) of the hip joints, which is the main component of canine hip dysplasia. Screening can occur when the dog is still young and is not yet showing any signs of OA. This allows breeders to determine if their dog is a good breeding candidate. For owners, it allows them to make lifestyle adjustments in advance to help decrease the negative effects of the disease as their dog ages. The testing is simple and non-invasive. The dog is first sedated to ensure completely accurate results. Then the veterinarian takes a series of radiographs with the dog’s legs in different positions. These radiographs allow the vet to visualize and measure the laxity, or looseness, of the hip joint. The looser the joint is, the more likely it is for the dog to later develop hip dysplasia. The veterinarian must be trained and certified to take images using this method. Dr. Carley was certified in 2004 and has been performing PennHIP screening ever since.